You may remember that my incentive for reorganizing my house was my son and his wife were temporarily moving to Paris, and we wanted to make room for some of their things. I didn’t mention that we are planning on visiting them there. On November 16 we will meet them in Malaga, Spain, for a week and then on to Paris for another week. This is causing me to focus on three main things for the next month. Lose weight. Always a focus before any trip, anniversary, high school reunion, summer, doctor appointment, etc. Get in shape – exercise. Depending on the trip, this may or may not be a priority for me. For this trip it is as we will be walking a lot. 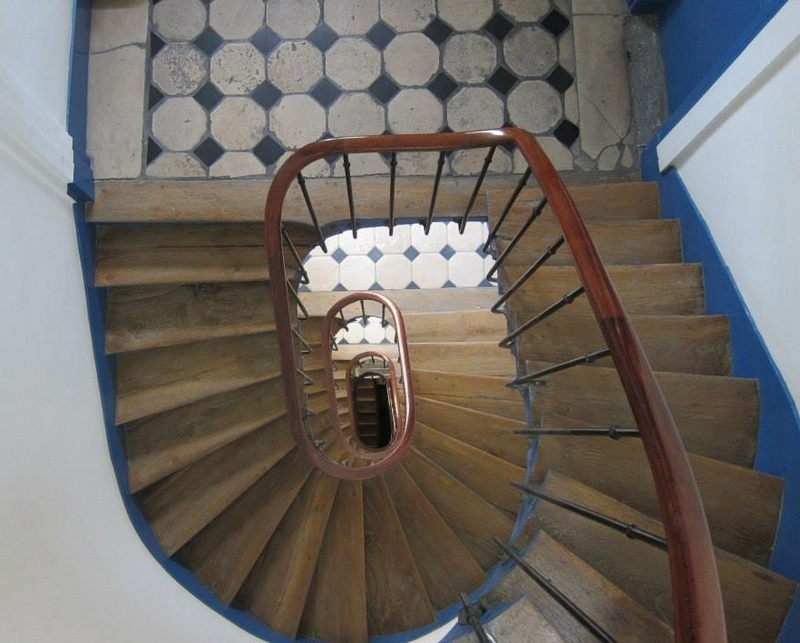 When we stay with Joe and Aubyron (pronounced Aubrin) in Paris, we will have seven flights of stairs to climb to get to their apartment. That also means there are seven flights to descend whenever we go out. I’m hoping that once I walk up, I will have the energy to go back down and actually see Paris. Brush up on my Spanish. This implies that my Spanish is “bueno.” It is not. I had two years of Spanish in high school. That was more than a few anos (years) ago. So here I am, tackling three big things at once, which is a rarity for me; but I am motivated. I am using MyFitnessPal to track my calories and exercise. It’s so easy and the app for my phone means it’s simple to keep track. I am either walking or doing Zumba on our Wii for my exercise. If you drive by my house in the daytime and see all my blinds closed, you can assume I am doing Zumba or passed out on the couch from just finishing a session. As far as learning espanol is concerned, I am using Instant Immersion. They tell me that I can have a short conversation with someone at this point in my lessons, but I’m not so sure. I heard two people conversing in Spanish the other day and I don’t think I made out but a couple of words. I like the program, but some of the words they want me to know seem odd. For example, is cauliflower some kind of big deal in Spain? It must be or why would I have to learn it (coliflor, in case you’re curious). Maybe they have advertisements there like they do here – GOT MILK? – TIENES COLIFLOR? I can’t wait to go to my first restaurant in Spain and flaunt my knowledge. I’m going to be so bi-lingual. When we get to Paris, we’ll let Joe and Aubyron take over communicating. We will probably be too winded from walking up and down and stairs to talk anyway. Aubyron has started a blog about their adventure. I think you will enjoy it. She is funny and real and takes lots of pictures. If you’re unable to travel to Paris, you can do so vicariously through her. Click here to read it. Enjoy! I’m coming in your suitcase. I don’t mind sharing with you Tara! 🙂 We’ll just have to make sure they get the big bag! I wish I could take you. I think the weight limit of 50 pounds is going to be a problem. I’m going to have to get a bigger suitcase! Thanks for sharing Parlez-vous anglais. I appreciate your daughter-in-law for giving us an opportunity to visit Paris. We are truly blessed thought our children. I love it. Thank you, Vanessa. You are right. We are so blessed through our children. Thanks for checking out her blog. I love it! I’m so proud of you for tackling three hard things all at once! I can’t wait until you guys are here! !…or I guess until we meet you in Spain! Thanks! I can’t wait to see you next month. Ole!